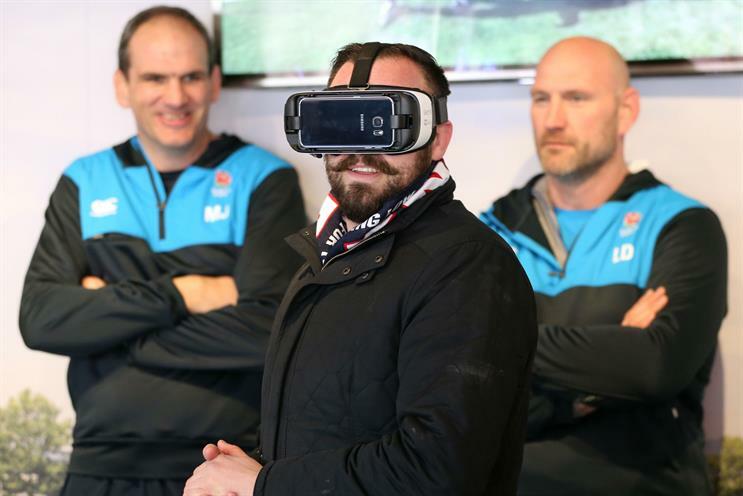 Samsung has launched a virtual reality (VR) experience as part of its ongoing 'School of Rugby' campaign, challenging fan reaction speeds against rugby heroes such as Martin Johnson and Lawrence Dallaglio. 'School of Rugby' was originally launched in TV ads in September 2014, featuring comedian Jack Whitehall. The aim of the spots was to demystify the sport ahead of the Rugby World Cup. In the most recent execution, Samsung invited people to play its VR game through its Gear VR headset and Galaxy S7 smartphone in a pop-up at Twickenham’s West Fan Village on Saturday, 27 February. Ahead of the Six Nations match at Twickenham, rugby legends Martin Johnson and Lawrence Dallaglio were on- site to surprise three selected participants when they took their headsets off. The stunt is reminiscent of Samsung's press conference at Mobile World Conference last month, where thousands of attendees were instructed to put on a Gear VR headset to see the new S7 phone up close. Facebook founder Mark Zuckerberg was standing on-stage when they took their headsets off. Lawrence Dallaglio said: "We had a lot of fun filming the Samsung School of Rugby campaign last year so it was great for Martin and I to be able to bring a little bit of that to the home of rugby at Twickenham. "It was great to see the expressions of some of the surprised fans as they took off their virtual headsets to be greeted by myself and Martin." Benjamin Blanco, head of sport and entertainment marketing at Samsung UK, added: "This year more than ever we want to connect our consumers with their passions and tell our emotional story. Through our work with Lawrence, Martin and England Rugby we were able to bring the new Samsung Gear VR, Galaxy S7 and Galaxy S7 edge products to life in an engaging way to heighten fans’ experience at Twickenham."